Hardwood flooring is graded to produce a consistent appearance. 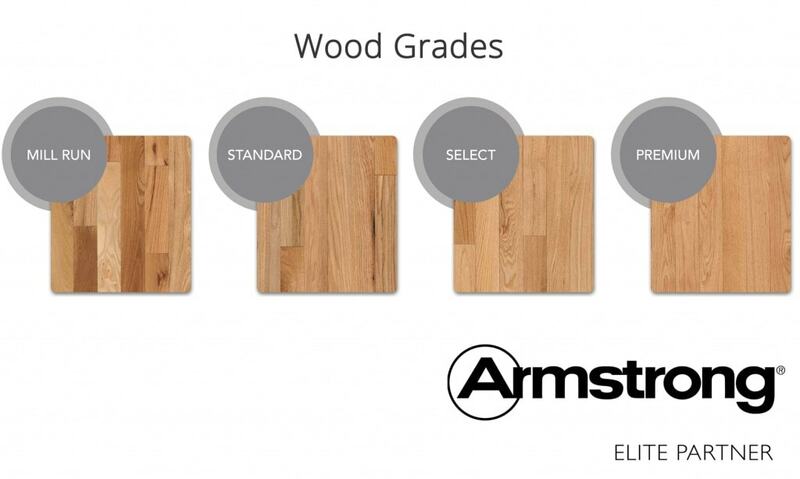 Grading provides certain aesthetic qualities which are considered when selecting the best hardwood flooring for the design you are creating. Common Grade Wood Floors contains more natural characteristics such as small worm holes, knots, and mineral streaks than the other grades. Common grade is more rustic in appearance and produces more of a “natural wood look”. Select Grade Wood Flooring may contain some small knots and color variations. Select grade is much more uniform than a common grade. Clear Grade Hardwood Floors is very uniform and only contains minor imperfections. Clear Grade is the most uniform. First Grade Hardwood Floors will provide natural color variations and only minor imperfections in the wood. Second Grade Wood Flooring will contain natural wood characteristics, color variation and minor knots. Third Grade Wood Floors is the most rustic of the grades and will contain all natural wood characteristics of that specie of wood Cuts: Angle at which the hardwood floor is cut at. The cut of the hardwood flooring refers to the angle at which the wood is cut. This will also determine the overall look of the hardwood flooring you are selecting. The most common hardwood floor board is plain sawn as well as the least expensive cut. The grain direction of this cut will vary widely from board to board and will provide the most variation in appearance. Plain sawn wood floors will also expand and contract the most of all cuts due to the grain direction. Quarter sawn cut hardwood flooring will produce a board with primarily vertical grain. This will not only provide a different aesthetic look of the finish product but is also more stable than a plain sawn board. Quarter sawn hardwood flooring will expand and contract less as well as reduce the possibility of cupping and twisting. Overall, a much more stable cut of wood flooring. Quarter Sawn wood flooring is the most expensive cut of wood flooring. Rift Sawn is very similar to the Quarter Sawn cut. Rift Sawn hardwood flooring will provide many of the same advantages as Quarter Sawn but is less expensive due to higher yield of material during the cutting process. Rift Sawn cut will not have as much vertical grain material as Quarter Sawn and is also less expensive.